This timeline of the development of the PLC by different manufacturers is a work in progress. If you have something to contribute or correct especially concerning Siemens or Mitsubishi then please contact me. PLCdev's article on The Birth of the PLC gives more information on how programmable logic controllers first got started. 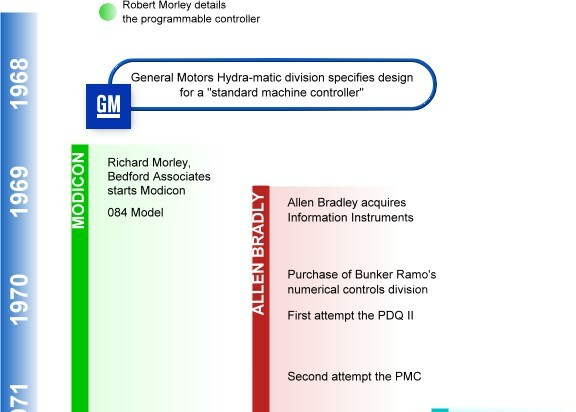 You always have to start with Richard Morley's dusting off of his memory cells to tell us about the History of the PLC. Both Richard Morley and Allen Bradley's Odo Struger were chosen as one of InTech's 50 most influential industry innovators. Schneider Electric's complete history entitled From Modest Beginnings to World Leader, 163 years in review also in a nice pdf format. Original text from the Schneider Electric website listing Modicon's history. New Zealand has saved this little treasure. Another good first hand account is Dr. Ernst Dummermuth's recollections in A Bit Twiddler's History of the PLC in the November 2002 A-B Journal. The Evolution of the PLC-5/1771 Controller System has a twisted path of development. Allen-Bradley: A Century of Quality covers the whole history of Rockwell Automation. The A-B Journal has a different layout on their timeline. There's an excellent timeline in the article PLC 25 Years: Rockwell Automation traces the 25-year history of the Allen-Bradley PLC. Submitted by pike (not verified) on Thu, 2011-01-20 06:22. Submitted by stenin (not verified) on Thu, 2011-12-29 02:21. This timeline of the development of the portable generator review plc by different manufacturers is a work in progress. Submitted by Mike Allow (not verified) on Fri, 2012-04-06 03:03. There are different points of view on this matter and these words of a professional amaze me. I would not mind if you do free research paper for a friend in need. Submitted by NugrohoBudi (not verified) on Mon, 2011-01-31 11:53.